A first-person shooter cheat that lets players shoot other player-characters without aiming. 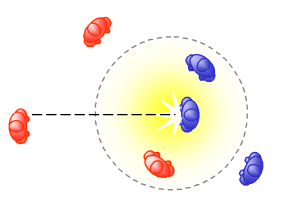 In most cases, the aiming reticle locks on to a target within the player's line of sight and the player only has to pull the trigger. Aimbots are one of the most popular cheats in multiplayer FPS, used since 1996's Quake. :119 Compare to the feature auto-aim. A coin-operated (or 'coin-op') game machine, often installed in an upright or tabletop ( cocktail) cabinet. Popular primarily during the late 1980s, arcade machines continue to be manufactured and sold worldwide. An early release of a video game, following its alpha release, where the game developer seeks feedback from players and testers to remove bugs prior to the product's commercial release. See also closed beta and open beta. A game code that allows the player to beat the game or acquire benefits without earning them. Cheats are used by designers to test the game during development and are often left in the release version. See god mode, aimbot, ESP cheats, noclip mode, wallhack, and Konami Code. 1. Programming used to ensure that the player stays within the physical boundaries of the game world. :119 Also see noclip, a cheat where clipping is disabled. Gameplay that develops as a result of player creativity, rather than the game's programmed structure. EVE Online is well-known for its emergent gameplay, which allows player-formed alliances to fight extended 'wars' over valuable territory and resources, or simply become 'space pirates' and prey on other player-operated vessels. To kill or achieve a kill in a game against a player or non-player opponent. See also gib. The code on which a game runs. There are different subsets of engines such as physics engines and graphics engines. Often the game engine is only middleware which game specific behaviours are built upon, though end-users do not tend to make this distinction. A cheat that makes player-characters invulnerable. :119 Occasionally adds invincibility, where the player can hurt enemies by touching them (e.g., the Super Mario Super Star). :357 The effect may be temporary. See flashing invulnerability. A player in a multiplayer video game who deliberately irritates and harasses other players within the game. Many online multiplayer games enforce rules that forbid griefing. A menu or area of the screen where items collected by the player-character during the game can be selected. This interface allows the player to retrieve single-use items for an instant effect or to equip the player-character with the item. A game mechanic in a fighting game or platform game where a character is thrown backwards from the force of an attack. During knock-back, the character is unable to change their direction until a short recovery animation is finished. Knock-back sometimes results in falling down pits if the character is standing close to the edge when hit with a knock-back attack. A game world that the player may freely traverse, rather than being restricted to certain pre-defined areas. While 'open world' and ' sandbox' are sometimes used interchangeably, the terms refer to different concepts and are not synonymous. A game element that involves searching an entire scene for a single (often pixel-sized) point of interactivity. Common in adventure games, most players consider 'hunt-the-pixel' puzzles to be a tedious chore, borne of inadequate game design. The text-adventure version of this problem is called 'guess-the-verb' or 'syntax puzzle'. Refers to fighting computer-controlled enemies ( non-player characters), as opposed to player versus player (PvP). The gradual unbalancing of a game due to successive releases of new content. The phenomenon may be caused by a number of different factors and, in extreme cases, can be damaging to the longevity of the game in which it takes place. Game expansions are usually stronger than previously existing content, giving consumers an incentive to buy it for competitions against other players or as new challenges for the single-player experience. While the average power level within the game rises, older content falls out of balance and becomes regressively outdated or relatively underpowered, effectively rendering it useless from a competitive or challenge-seeking viewpoint. Rage quitting, sometimes referred to as gamer rage,  is the act of quitting a game mid-progress instead of waiting for the game to end. Typically, this is associated with leaving in frustration, such as unpleasant communication with other players, being annoyed, or losing the game. However, the reasons can vary beyond frustration, such as being unable to play due to the way the game has progressed, bad sportsmanship, manipulating game statistics, or having network connection problems. There are also social implications of rage quitting, such as making other players rage quit. Certain games can penalize the player for leaving early. Contrast with drop-in, drop-out. The manipulation of game save states to gain an advantage during play or achieve a particular outcome from unpredictable events. It is used, for example, in Roguelike games that automatically delete any save files when the player-character dies. A genre of video game that involves using ranged weapons. See also first-person shooter. A widely- licensed video game released in large volume with little attention to quality. In online multiplayer games that use matchmaking, a smurf is a new account used by an experienced player in order to be matched with a new and inexperienced opponent who can be easily defeated. The concept is similar to hustling and sandbagging that can be found in gambling and board games. See also twinking. The killing of teammates through destruction or damage done to allies, such as through deliberate shooting of teammates. Teamkilling is often identified as unsportsmanlike behavior. Related to the military term " fragging". A description of the gameplay experience for a level or playthrough, intended to guide players who are unsure how to complete it. See also strategy guide. A cheat that makes walls translucent. :119 Some wallhacks let players shoot weapons or physically pass through walls. :120 See noclip. In free-to-play games, a user that spends a considerable amount of real-world money for in-game items, rather than acquiring said items through grinding or playing the game normally. These players are typically seen as the largest segment for revenue production for free-to-play titles. "White whales" may also be used to describe exceptionally high spenders. Borrowed from gambling jargon; a 'whale', in that context, is a person who makes extravagant wagers or places reckless bets. Camera wrapping is a technique often used in video games, which allows a player to move in a straight line and get back to where they started. [clarification needed] This was more often used in older games to make it seem that the player is moving up or down an extremely high hill; memory can be saved by using wrapping instead of creating a larger area filled with impassable walls. 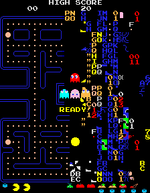 Wrapping is also used to make a 2D game world round; for example, in PacMan exiting the game screen to the right wraps the player to the same position on the left side of the screen. Similarly, in Final Fantasy VII, exiting the game map to the right wraps the player to the same position on the left side of the map, and exiting the map to the top wraps the player to the bottom of the map. Gameplay that utilizes overwhelming numbers rather than skill or strategy. See also rush. This page is based on the Wikipedia article Glossary of video game terms; it is used under the Creative Commons Attribution-ShareAlike 3.0 Unported License (CC-BY-SA). You may redistribute it, verbatim or modified, providing that you comply with the terms of the CC-BY-SA.